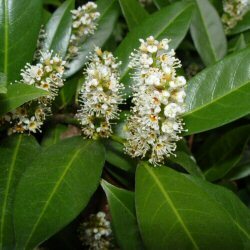 Cherry Laurel is ideal if your requirements are for a fast-growing, windbreak, dense evergreen hedge. Its leaves, which are large, glossy, bright green coloured make for an attractive hedge. In addition it carries white flowers in spring and red berries during Autumn. We have found the growth rate to be between 30cm (1ft) and 60cm (2ft). Trimming in Spring or Autumn is recommended. Cherry Laurel is a very hardy species. being most suitable for planting at high elevations and will even grow in heavy shade. 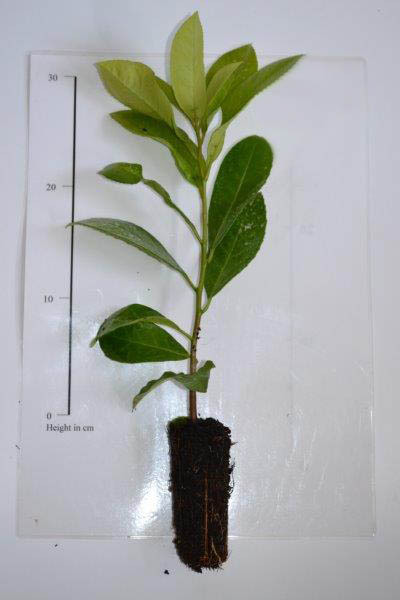 We do not recommend Cherry Laurel for coastal locations or alkaline soil such as chalk. A good choice for higher elevations. Do also note that the leaves and berries are poisonous if consumed. Feel free to prune hard, even back to brown wood as Cherry Laurel will bounce back without issue. Expect Cherry laurel to grow roughly 10m high x 10m wide if left alone. By that we mean left along with the pruning shears and not deep meaningful discussions with it. A close alternative to Cherry Laurel is Portugal Laurel. Our cherry laurel (prunus laurocerasus) hedging trees are sold as plug plants, in other words the roots are encased in compost. This means that planting can be carried out at any time of the year, provided they are watered in periods of drought, compared to bare-root plants which can only be planted during the plants normal dormant period (November to March). All of these trees are UK grown, which is important for successful establishment. We suggest using secateurs instead of pruning shears or hedge trimmers. This is because cut leaves will go brown on the edges and look unattractive. Better to trim further back on the branch. If the plant requires a heavy prune such as a reshape or renovation prune then carry this out over a couple of years. How many cherry laurel hedging trees do I need? It does not happen often but sometimes the point of pruning can be a weak point, especially in very warm weather. On very young plants like the ones we sell, this can give the impression someone has knocked them and broken the upper shoot. This is perfectly normal and is not a plant defect. Either a new bud will grow or the lower branch will take over as the main leader. Shot hole is a common issue with most Prunus and is more an aesthetic issue than serious, in fact many nurseries don't actively treat it. It is a fungus issue caused by low sunlight and high water. Improving air circulation and reducing water will help. You can do this by pruning to allow more air and light into the tree, keeping nearby grass short and water the base of plants not the whole foliage. Some of the leaves will have small holes in them as if blasted with a shotgun. This looks much worse on a younger tree as you can see more of the leaves with it but as the tree ages and more foliage is made then it becomes less noticeable. It is most likely that the next season will return intact leaves as it is weather dependent. Treatment is somewhere between a "waste of time" and "should do something" depending on who you ask. If you are not happy to wait for the next season then applying fungicide, copper or sulphur based treatments have been the historical approach to this problem.